One of the most beautiful islands in Malaysia is Perhentian Island, which actually consists of a big island and a small island. Both islands offer fantastic scuba diving and snorkeling facilities. The islands are especially famous because of the laid-back atmosphere. Alongside the beaches you will find basic lodges, moderately luxurious resorts, cozy restaurants, dive centers and boat operators advertising their services ranging from water taxis to snorkeling trips. Lake Kenyir is a beautiful lake located in the state of Terengganu in northeast Malaysia. It is the largest man-made lake in Southeast Asia. The lake borders the wildlife park Taman Negara to the west. In and around Lake Kenyir you will find hundreds of small islands, stunning waterfalls and amazing caves. Lucky travelers can spot wild animals, birds and insects like hornbills, monkeys, snakes, spiders and even wild elephants and tigers. Taman Negara is one of the world's oldest primary rainforests. The national park stretches roughly across the center of Peninsular Malaysia and is easily accessible from the capital city of Kuala Lumpur. Over recent years the park developed into a popular ecotourism destination. Taman Negara is home to some very rare mammals but due to the sheer size of the park, close encounters with wildlife is not that common. 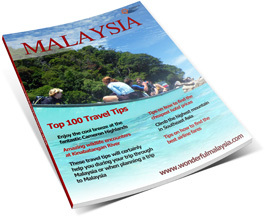 The tropical island of Langkawi is one of the most popular destinations within Malaysia. Though the island is recognised as one of the most beautiful islands in the world; you will never feel you're visiting a crowded tourist overrun island. Visit Langkawi for wonderful jungle, fantastic sightseeing and beautiful beaches. There is an abundance of accommodation available for every type of traveler, ranging from basic B&B's to luxurious 5-star resorts. Below the statistics from Wonderful Malaysia. These figures are based on GA output.